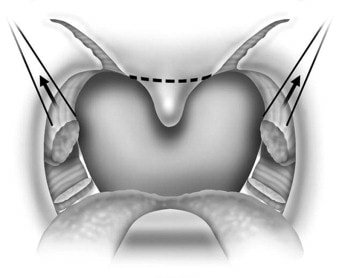 Depending on the type of soft palate obstruction (front to back, side to side, concentric) a specific procedure will be chosen to open the obstruction in the appropriate direction. Different palatal surgeries with modifications are available. This procedure addresses lower throat obstruction by advancing a small neck bone (hyoid bone) forward suspending it to the front of the lower jaw. The hyoid suspension expands and stabilizes the airway during sleep making obstruction less likely to occur. The hyoid bone is brought closer to the front of the lower jaw, which enlarges the airway when sleeping. After portions of the base of tongue are removed the airway is larger and OSA is improved.